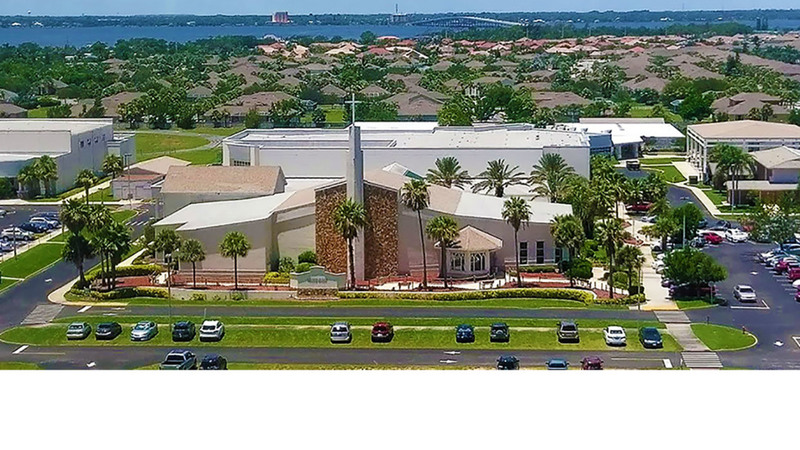 Holy Name of Jesus humbly began as a mission parish of Ascension Catholic Church in Eau Gallie, FL. On Christmas Eve 1959, the first Mass was celebrated by Reverend Father Martin B. Power in Marty McGuire’s unfinished house in Indian Harbour Beach. The Most Reverend Joseph P. Hurley, Archbishop of St. Augustine (affectionately known as “Ten Acre Joe” for his farsighted policy of buying ten-acre parish sites) had purchased our first ten acres in 1956. At the suggestion of Father Power, an additional 3.7 acres was purchased in June of 1961, with a 290’ frontage on Highway A1A. Ground was broken for a provisional Church on September 9, 1962. The Church had a seating capacity of 480 and included a 2,000-sq. ft. Hall. Archbishop Hurley dedicated the Church and Hall in March 1963. There were about 250 families in the Church when the dedication took place. The children of HNJ attended Ascension School, which opened in September, 1961, staffed by the Irish Sisters of Mercy of Ardee, Ireland. Due to population growth in the area, Father Power recognized the immediate need of a school at HNJ. In March, 1964, the school had promising beginnings with approximately 50 students and three grades. Classes were held in the Church Hall. By September, 1964, the new school was completed and housed the first four grades. Each year, an additional grade was added through the eighth grade. In 1965, portable buildings were added, and in 1968, kindergarten opened. Technically, HNJ remained a mission of Ascension Parish until May, 1968, when Monsignor Power was appointed Pastor of HNJ by The Most Reverend William D. Borders. A year later, Monsignor Power was transferred to Lakeland where he died suddenly on March 22, 1972. Fr. Arthur Dunnigan was named the second Pastor of HNJ in June, 1969. He was instrumental in purchasing valuable land with 367’ of frontage on A1A and adjacent to the existing church property. This 4.3-acre property purchased in 1970 included the Greystone Apartments, which were converted to a priest residence while the garage was converted into parish offices. HNJ now had approximately 18 acres of prime property. In February, 1974, Fr. Arthur Dunnigan took a leave of absence due to illness. Fr. Patrick Quinn became the third Pastor of HNJ from 1974-76 and Fr. Peter J. Henry, who served during that time as Associate Pastor, was appointed the fourth Pastor in September of 1976. Due to the rapid growth of HNJ, the provisional Church built in 1963 became overcrowded so Fr. Henry initiated a major fund drive in 1978 and raised a million dollars to build the permanent church with a seating capacity of 800 people. The Most Reverend Thomas Grady, Bishop of Orlando, dedicated the Church on October 26, 1980. Fr. David P. Page, former Rector of St. James Cathedral, Orlando, became the fifth Pastor of HNJ in January, 1987. Advancements continued with the parish becoming computerized in 1988. The convent was renovated in 1989 and was converted into the Administration Center to house much needed offices for the pastoral and lay staff members. During 1987-88, a nationally known consultant on church process, facilitated a parish-wide program called Vision 2000 in which parishioners decided on priorities, both in regard to ministry and facilities. This, in turn, led to the restructuring of the parish ministries into five commissions with pastoral and business administrators serving directly under the pastor. A successful capital fund drive was conducted in the Fall of 1988 to provide an education center, an activity center, a sports pavilion, a traffic light on A1A, sewer for the entire parish plant, as well as 10 acres of adjoining property for parking and expansion. Continuing into the 90’s, new ministries were developed and many new buildings were constructed, including ten additional classrooms. At this time, the school had 430 students as well as 76 three- and four-year-old preschoolers. A rectory for the priests was completed in 1995, thus providing space in the old rectory for the expansion of the St. Vincent de Paul Assistance Center, the Outreach Thrift Store. The continued growth of the parish to about 3000 families once again presented the need for a larger worship space. In August, 1997, work began on an expanded place of worship to seat 1300 people (including a 155 seat overflow daily liturgy chapel, Adoration Chapel & covering for the Atrium). Fr. David P. Page, Pastor, celebrated the first Mass on August 23, 1998, and the Most Reverend Norbert M. Dorsey, Bishop of Orlando, dedicated the Church on October 4, 1998. In 2001, HNJ School was recognized as a U.S. Dept. of Education Blue Ribbon School of Excellence and in 2003, was given a U.S. Department of Education “No Child Left Behind Award”. In 2004, the bronze Jesus statue was installed in the Atrium. This year hurricanes Charlie, Francis and Jeanne unfortunately damaged a great deal of the property, necessitating the new building fund drive, “Share the Vision”. In 2006 & 07, the school received 8 new modular classrooms and a new soccer & track field. Also in 2007, the Athletic Center was completed and the refurbished Thrift Shop and St. Vincent de Paul Outreach re-opened. In 2008, the Life Center opened, containing the parish offices, parish hall and meeting rooms. Msgr. David Page (in 2008 he was given the Honorary title of Monsignor by the Pope Benedict XVI.) retired in 2010 and Fr. Tony Welle who was serving as Associate Pastor, was appointed as the sixth Pastor in July of 2010. In 2012, the Book & Gift Shop was relocated into a larger space in the Life Center and reopened as In His Holy Name Book & Gift Shop. Our shop carries unique, quality Catholic books and gifts for every occasion – with selections of jewelry, rosaries, statues, sacramentals, crucifixes and more. In 2013, the old Book & Gift Shop in the church was renovated and reopened as the new Welcome Center. If you are new to the parish and would like to register, please visit the Welcome Center after any weekend Mass and complete a registration form. Information on our various ministries and events can also be found here. In 2016, we broke ground on an addition to the rectory to serve as a retirement suite for Msgr. Page and future retired clergy. In July of 2017, Fr. Scott Circe was appointed the seventh Pastor of HNJ. Previously he had served at Annunciation Catholic Church in Altamonte Springs, St. James Cathedral in Orlando, Most Precious Blood in Oviedo, and was the Vice Rector, Dean of Students, formation advisor and lecturer in theology at St. John Vianney College Seminary in Miami. As we look back with gratitude to those parishioners and clergy who paved the way for the present generation, we continue to look forward to fulfilling the vision God has given us for the future.